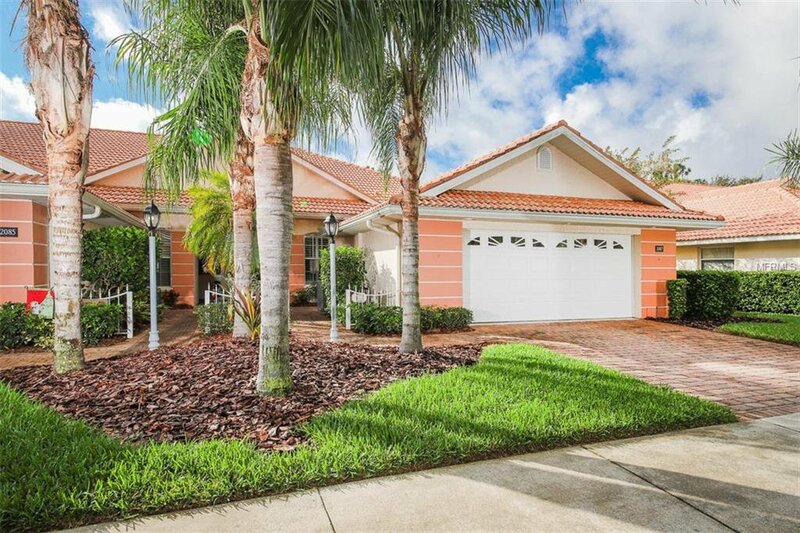 This much desired end unit Villa in Bobcat Trail with a beautiful pond view is the home of the newly renovated Charlotte Harbor National Golf Course. The unit is well maintained and includes an open floor plan with lots and lots of light. This Villa offers 2 bedrooms and 2 baths with a den, and an oversized 2-car garage. Large kitchen with, newer refrigerator and dishwasher and plenty of Corian counter space, with tile in the kitchen, baths, dining room and living room. Carpet in the bedrooms and laminate flooring in the den. Double doors lead you into the ample sized Master suite with dual sinks and shower. Laundry is located inside home. The lanai area is equipped with electronic hurricane shutters and pavers. Membership to the golf club is optional, however you can still enjoy the other amenities that Bobcat has to offer, such as a community pool, tennis court, pickle ball, fitness center, and a community center where daily activities take place. There is an onsite restaurant at the club house that is open to the public. Bobcat is conveniently located close to US 41, I 75, urgent medical care, restaurants, shopping and only 30 minutes to the beach. The CDD of $1744.65 is included in the tax amount as shown. Some furniture included. Listing courtesy of MICHAEL SAUNDERS & COMPANY. Selling Office: RE/MAX HARBOR REALTY.